James P. Tucker, Jr., the “Bilderberg Hound,” passed away last year, on April 26, following a fall. Jim had devoted the better part of his life hounding the Bilderberg Group, which he memorialized in his book Jim Tucker’s Bilderberg Diary*. Big Jim’s passing affected all of us here at AMERICAN FREE PRESS, and we know from your correspondence that it affected many of you as well. Jimbo was such a big part of AFP’s Bilderberg coverage, since he was first apprised of this shadowy group in the mid-1970s by Willis A. Carto, that he could have left a gaping hole in this area. Fortunately, Jim was never one to secret away what he had gleaned, and he helped prepare the younger generation to pick up where he left off. All of us here at AFP will have Jim in our memories, as we continue to hound the Bilderbergers in Denmark next month, and in the years ahead. As you could imagine, chasing these “criminals,” as Jim called them, isn’t cheap. Because we tell the truth, this newspaper doesn’t have the advertisers that the corrupt mainstream media has, which provides them with near unlimited funds to spread their poisonous propaganda across the planet. Please help allow us to continue to hunt down the Bilderbergers, wherever they hide, and keep Tucker’s dream alive: that no person or group should ever be in a position to affect public policy in the shadows. Jim changed the way this group operates. With AFP’s guidance, he almost single-handedly flushed them out of the dark corners where the elite hide to scheme how they can get more and you can get less. Make a donation** today in Jim’s memory. * Every copy of Jim Tucker’s Bilderberg Diary comes with a FREE 1-YEAR DIGITAL SUBSCRIPTION to AMERICAN FREE PRESS, America’s Last Real Newspaper. 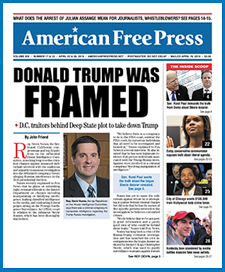 ** Every donation comes with a FREE 1-YEAR DIGITAL SUBSCRIPTION to AMERICAN FREE PRESS, America’s Last Real Newspaper.